Here are the first-ever images that show the Indian Army-spec Tata Safari Storme in all its glory. 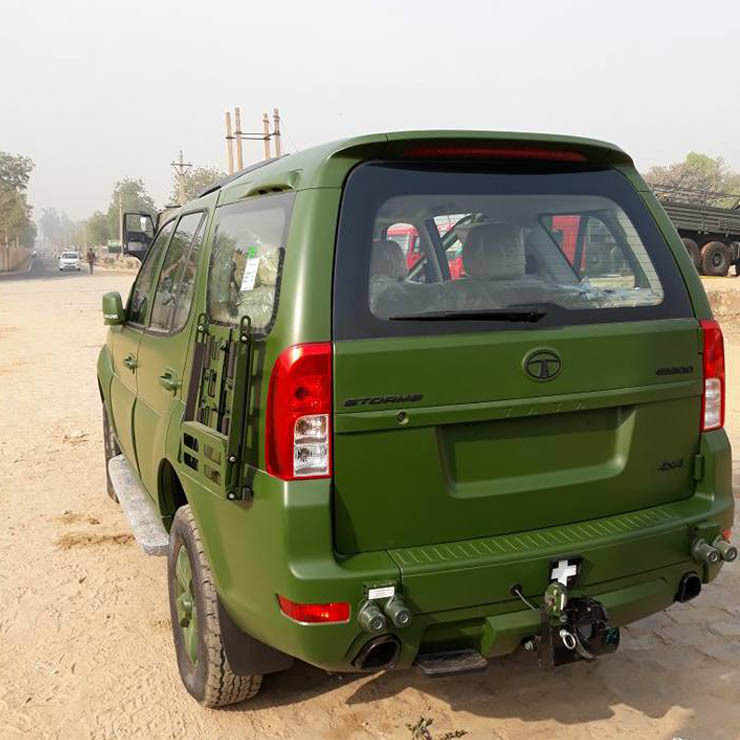 It may be noted that Pune-based Tata Motors pipped Mahindra and Mahindra and Nissan to bag the order from the Indian Army for supplying personnel carrier vehicles to the Force. The Army chose the Safari Storme, and now the popular Indian passenger car maker will supply as many as 3,192 units of this SUV. 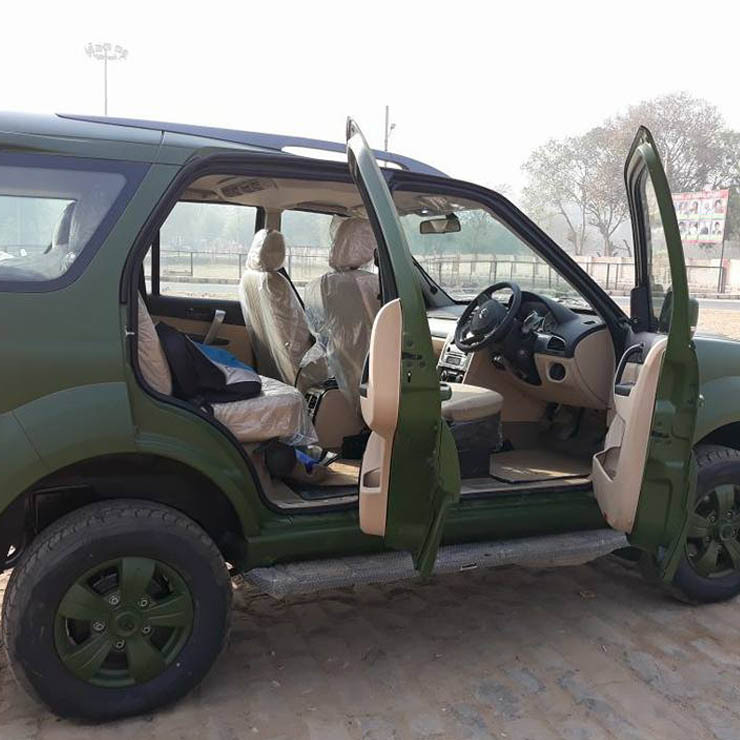 As you can see in the images we have here, the Army-spec Safari Storme comes in the green paint shade that is a characteristic of most Indian Army vehicles. The entire car is covered in this shade of green – there’s no chrome anywhere and every plastic part color matches with the sheet metal. The only non-green accessories are the foot-steps and the roof rails. Even the five-spoke alloy wheels have been painted the same shade of green. Other than that, there’s a canister-carrier on the rear-left fender. In addition, there’s a pintle hook at the rear, a stubby antenna on the hood, and a pair of spotlights on the front bumper. The interior is draped in a shade of beige. Details of the equipment level aren’t available at the moment. Powering the Tata Safari Storm is a 2.2-liter, 4-cylinder, turbocharged diesel engine that produces a maximum power of 154 bhp at 4,000 rpm along with a peak torque of 400 Nm from 1,700 to 2,700 rpm. The motor comes mated to a six-speed manual transmission. Also, the Army-spec Safari Storme benefits from a 4X4 transfer case that offers both low and high ratios. This is a shift-on-fly system that can be operated via a rotary knob near the transmission gear lever. In essence, the Safari Storme will replace the aging Maruti Gypsy in the Army’s arsenal. The Safari Storme will be majorly used as a personnel carrier, and even for some reconnaissance missions. The high ground clearance of 200 mm, the ladder-on-frame chassis and the four wheel drive mechanism allow the Safari Storme to easily traverse the roughest of terrains.